It's really been a while since my last post... But in the middle, three major conferences kept me away from my blog. I said to myself I had to blog about the topics of my talks, but I had no chance at all. 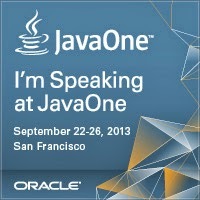 Now, with JavaOne still far in the distance, and after finishing my collaboration in the book, soon to be published, JavaFX 8, Introduction by Example, with my friends Carl Dea, Gerrit Grunwald, Mark Heckler and Sean Phillips, I've had the chance to play with Java 8 and JavaFX 3D for a few weeks, and this post is the result of my findings. 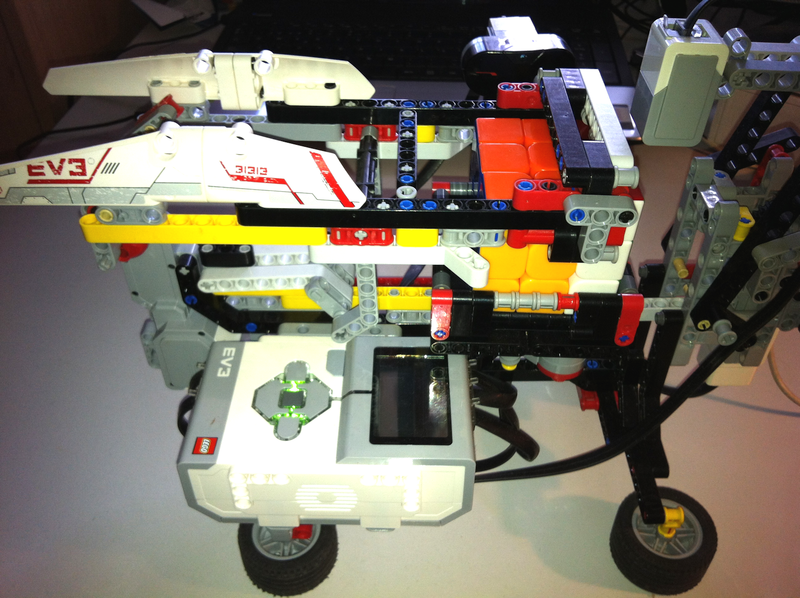 It happens that my kids had recently at home a Rubik's cube, and we also built the Lego Mindstorms EV3 solver thanks to this incredible project from David Gilday, the guy behind the CubeStormer 3 with the world record of fastest solving. 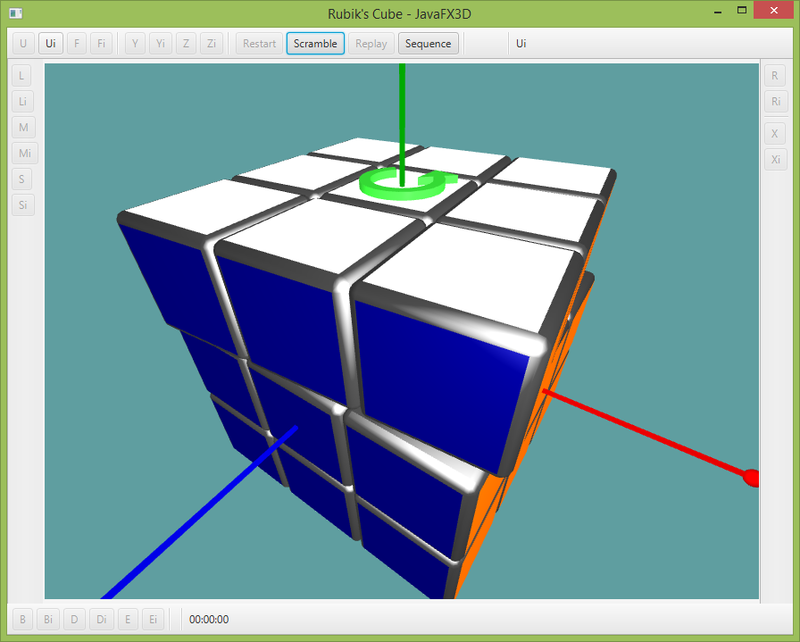 After playing with the cube for a while, I thought about the possibility of creating a JavaFX application for solving the cube, and that's how RubikFX was born. If you're eager to know what this is about, here is a link to a video in YouTube which will show you most of it. Basically, in this post I'll talk about importing 3D models in a JavaFX scene, with the ability to zoom, rotate, scale them, add lights, move the camera,... Once we have a nice 3D model of the Rubik's cube, we will try to create a way of moving layers independently from the rest of the model, keeping track of the changes made. Finally, we'll add mouse picking for selecting faces and rotating layers. Please read this if you're not familiar with Rubik's cube notation and the basic steps for solving it. By now you should know that Java 8 is GA since the 18th of March, so the code in this project is based on this version. In case you haven't done it yet, please download from here the new SDK and update your system. Also, I use NetBeans 8.0 for its support for Java 8 including lambdas and the new Streams API, among other things. You can update your IDE from here. I use two external dependencies. One for importing the model, from a experimental project called 3DViewer, which is part of the OpenJFX project. So we need to download it and build it. The second one is from the ControlsFX project, for adding cool dialogs to the application. Download it from here. Finally, we need a 3D model for the cube. You can build it yourself or use a free model, like this, submitted by 3dregenerator, which you can download in 3ds or OBJ formats. For that, just extract the files, rename 'Rubik's Cube.mtl' to 'Cube.mtl' and 'Rubik's Cube.obj' to 'Cube.obj', edit this file and change the third line to 'mtllib Cube.mtl', and save the file. 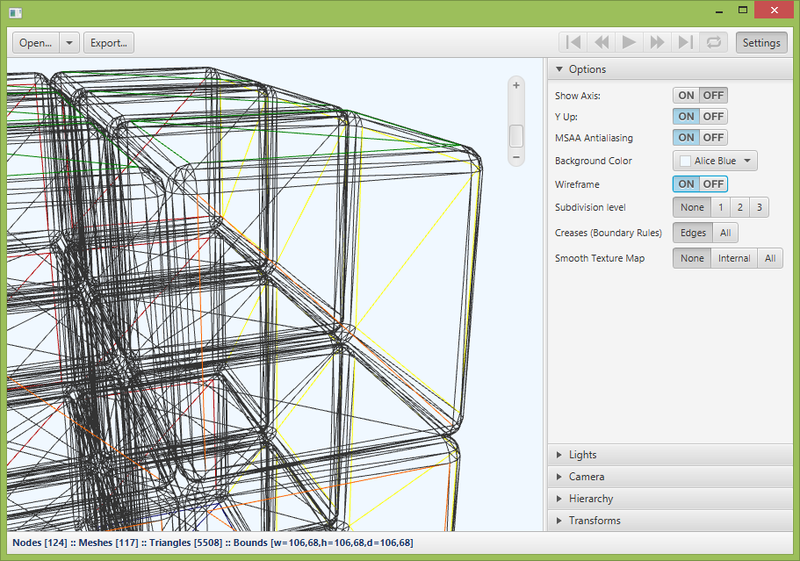 Now run the 3DViewer application, and drag 'Cube.obj' to the viewer. Open Settings tab, and select Lights, turn on the ambient light with a white color, and off the puntual Light 1. You can zoom in or out (mouse wheel, right button or navigation bar), rotate the cube with the left button (modifying rotation speed with Ctrl or Shift), or translate the model with both mouse buttons pressed. 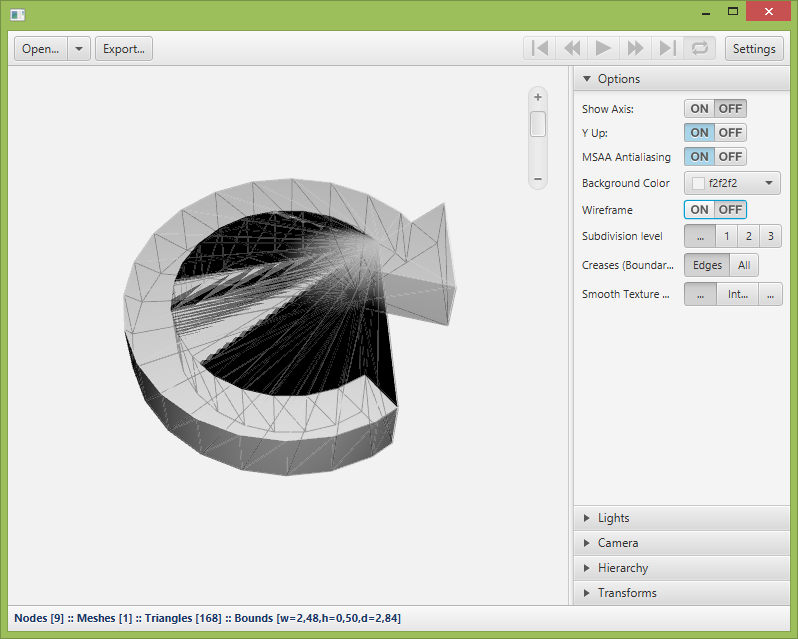 Now select Options and click Wireframe, so you can see the triangle meshes used to build the model. Each one of the 27 cubies is given a name in the obj file, like 'Block46' and so on. All of its triangles are grouped in meshes defined by the material assigned, so each cubie is made of 1 to 6 meshes, with names like 'Block46', 'Block46 (2)' and so on, and there are a total number of 117 meshes. 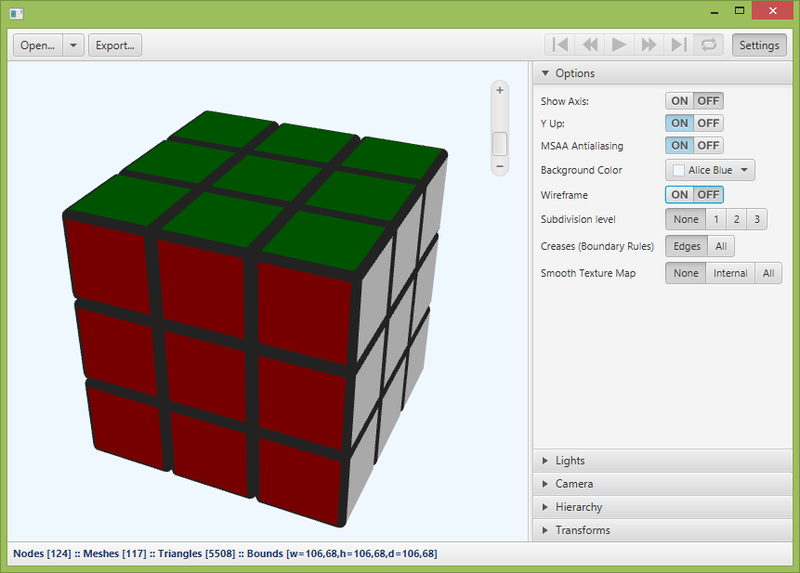 The color of each cubie meshes is asigned in the 'Cube.mtl' file with the Kd constant relative to the diffuse color. So once we know how is our model, we need to construct the MeshView nodes for each mesh. The ObjImporter class from 3DViewer provide a getMeshes() method that returns a Set of names of the blocks for every mesh. So we will define a HashMap to bind every name to its MeshView. For each mesh name s we get the MeshView object with buildMeshView(s) method. By design, the cube materials in this model don't reflect light (Ns=0), so we'll change this to allow interaction with puntual lights, by modifying the material specular power property, defined in the PhongMaterial class. Finally, we will rotate the original model so we have the white face on the top, and the blue one on the front. Since the model is oriented with white to the right (X axis) and red in the front (Z axis) (see picture above), two rotations are required: first rotate -90 degrees towards X axis, to put blue in the front, and then rotate 90 degrees arount Z axis to put white on top. Though it does the right rotations, then it will require for further rotations of any cubie to be rotated from its original position, which is quite more complicated than rotating always from the last state. So prepend is the right way to proceed here, and we just need to prepend the last rotation matrix to the Affine matrix of the cubie with all the previous rotations stored there. first 9 indexes are the 9 cubies in the (F)Front face, from top left (R/W/B) to down right (Y/O/B). second 9 indexes are from the (S)Standing face, from top left (R/W) to down right (Y/O). last 9 indexes are from (B)Back face, from top left (G/R/W) to down right (G/Y/O). where 50 is the number of the R/W/B cubie and 72 is the number for the G/Y/O. The Rotations class will take care of any face rotation. Similar rotations can be performed to the whole cube (X, Y or Z). Then we add the listeners to the subscene, so the camera can be easily rotated. Now we can put all together and create the Rubik class, where the 3D model is imported, all the meshviews are created and grouped in cube, which is added to the content subscene. At the same time, rot is instantiated with the original position of the cubies. Finally we create a listener for rotating layers of cubies in a Timeline animation. As the rotations are prepended to the actual affine matrix of the cubies, to perform a smooth animation we'll change the angle between 0 and 90º, and listen how the timeline internally interpolate it, making small rotations between angNew and angOld angles. // select cubies to rotate: those in reorder different from order. Later on we'll add more features, but for now let's create a JavaFX application, with a BorderPane, add content to the center of the pane, and a few toolbars with buttons to perform rotations. If you're interested in having a deeper look at the application, you can find the source code in my GitHub repository. Note you'll need to add the 3DViewer.jar. Once we've got the cubies and the axis of rotation, now it's worth noticing how the rotation listener works. With the timeline, the angle goes from 0 to 90º with an EASE_BOTH interpolation (by default), so the angle increments are smaller at the beginning, bigger in the middle and smaller again at the end. This could be a possible list of increments: 0.125º-3º-4.6º-2.2º-2.48º-...-2.43º-4.78º-2.4º-2.4º-0.55º. So in 600 ms we apply around 30 to 40 small rotations to a bunch of around 40 meshviews. Finally, after the rotation is done, we just need to update order with the last list of cubies, so we can start all over again with a new rotation. 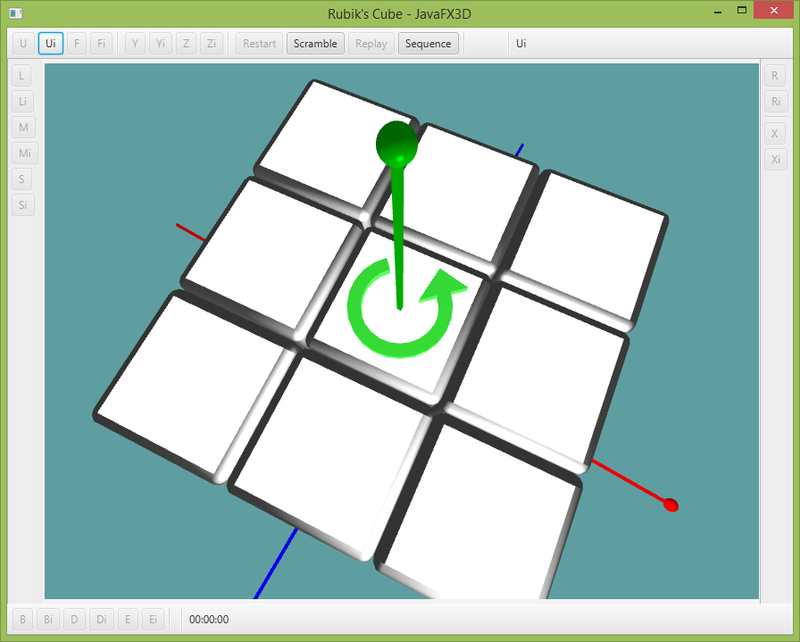 Now that we've got a working but pretty basic Rubik's cube JavaFX application, it's time for adding a few extra features, like graphic arrows and preview rotations to show the direction of rotation before they're performed. Let's start by adding a scramble routine, to scramble the cubies before start solving the cube. To do that we generate a sequence of 25 random moves from a list of valid rotations. Then we have to perform this sequence, by rotating each movement. First we extract the rotations from the string, converting other notations (like lower letters or ' instead of 'i' for counter clockwise rotations) to the one used. A listener is added to onRotation, so only when the last rotation finishes, a new rotation starts. By adding a second listener to the index property, when the end of the list plus one is reached, this listener is stopped, allowing for the last rotation to finish properly, and saving the rotations for a further replay option. Note that we use a Dialog from ControlsFX to prevent losing previous moves. If you want to load a sequence, like any of these, another Dialog with input allowed is used. The results of scrambling a cube or adding a sequence of rotations can be seen in this video. 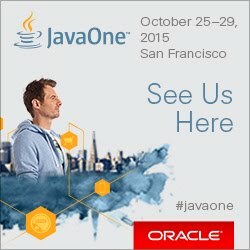 Let's add now a timer using the new Date and Time API for Java 8. You may have noticed the timer in the bottom toolbar in the previous video. For the counter, we'll add two classes. Move is a simple POJO class, with a string for the name of the rotation and a long for the timestamp of the movement. Moves class will contain a list of moves. We can also replay the list of movements the user has done stored in moves. For that we need to restore first the state of the cube right after the scramble, and performe one by one all the rotations from the list. Time for a new feature: 3D arrows will be shown in the rotating face or axis, to show the direction. 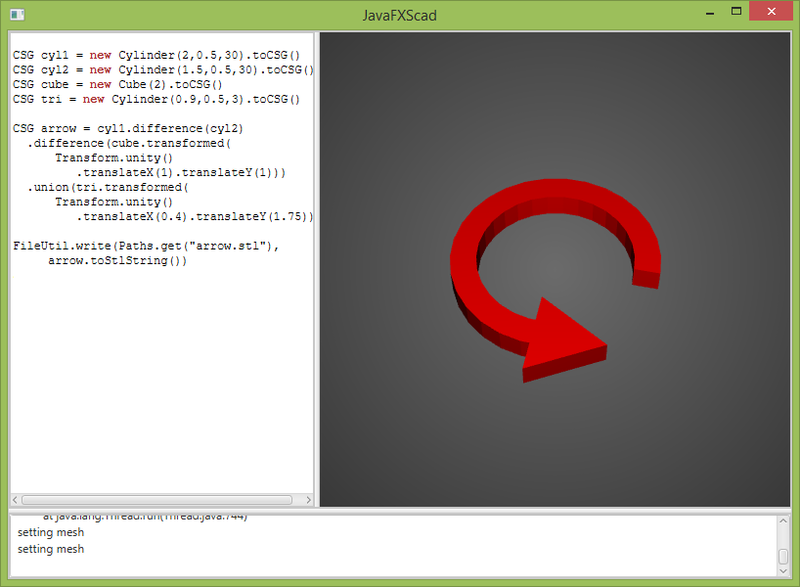 Actually, JavaFX 3D API doesn't supply any way of building 3D complex models. There's an impressive ongoing work by Michael Hoffer to provide a way by using Constructive Solid Geometry (CSG) here, kudos Michael!! 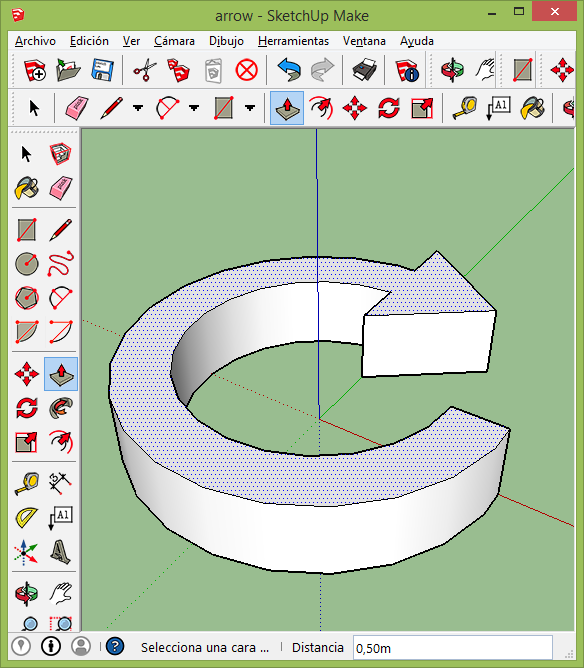 By using primitives and boolean operations with CSG you can build a model, and even export it with STL format. You can use free or commercial 3D software for this task too. I designed these arrows with SketchUp Make and exported them to OBJ format so I could import them as we did with the cube using ObjImporter from 3DViewer. While the design is fast, it requires manual editting of the created obj file to convert long faces of more than 4 vertixes as they are not properly imported. Other approach could be exporting the file to *.3ds and use the proper importer from August Lammersdorf. Edit: Michael Hoffer kindly added an option to export to OBJ format, so now it would be possible to import the arrow model generated with CSG in JavaFXScad in our scene. Thanks Michael! Once we have the model, we have to add it, scale and rotate it, so we can show the arrow in the rotating face. To trigger the drawing of the arrow, we set a listener to the buttons on the toolbars based on the mouse hovering. We can also add a small rotation (5º) as preview of the full rotation (90º) in the face selected, by calling rotateFace again, with bPreview=true at this point. If the user clicks on the button, the rotation is completed (from 5º to 90º). Otherwise the rotation is cancelled (from 5º to 0º). In both cases, with a smooth animation. Finally, the rotation could be performed based on the mouse picking of a cubie face, with visual aid showing the arrow and performing a small rotation of 5º. If the mouse is dragged far enough the full rotation will be performed after it is released. If the mouse is released close to the origin, the rotation is cancelled. For this feature, the critical part is being able to know which mesh we are selecting with the mouse click. And for that, the API provides MouseEvent.getPickResult().getIntersectedNode(), which returns one of the meshviews on the cube. So the next step is find which is this meshview and what cubie does it belongs to. As all the meshes have a name, like 'Block46 (2)', looking at the number of block we identify the cubie. Now we need to find which of the faces we have selected. For that we use the triangles coordinates of the mesh, as for the faces they define a plane, so with the cross product we know the normal direction of this plane. Note we must update the operations with the actual set of transformations applied. Once we have the normal, we can provide the user with two possible rotations (and their possible two directions). To select which one to perform, we'll look how the user moves the mouse while it's being dragged. Note the mouse coordinates are 2D. Now that we have the layer to rotate, we make a small rotation as a preview of rotation if the mouse is dragged far from the initial click point, with a minimum distance. Then if the user releases the mouse and the distance from the initial point is greater than a distance radClick, the rotation is completed. But if the distance is lower or the mouse is dragged under the distance radMinimum, the rotation is cancelled. The next listing shows an EventHandler<MouseEvent> implemented to provide this behaviour. Note that we have to stop the camera rotations while we are picking a face and rotating a layer. This video shows how this event handling works. Finally, let's add a check routine. We know the initial solved order of cubies, but we need to take into account any of the 24 possible orientations of the faces, which can be acchieved with up to two rotations. We've used the new lambdas and Stream API. I hope by now you've got a clear view of what you can do with them. For sure, they will definetely change the way we write code. The Rubik's cube application has proven to be a nice way of testing these new capabilities, while enjoying playing, humm, I mean, developing the code. In my repo you can find all the code for this full version. Fill free to fork it and play with it. There're tons of improvements to make, so any pull request will be welcome! Edit: And if you just want to try it before having a look at the code, here you can download a single executable jar. 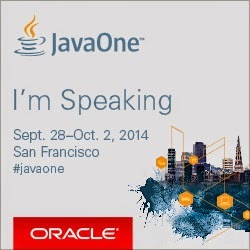 Download it and run it with Java 8 installed. As always, thanks for reading me! Please, try it for yourself and share any comment you may have. Awesome! Great code and great application! I prefer the CFOP method for solving the cube!! Amazing! I really like your application! 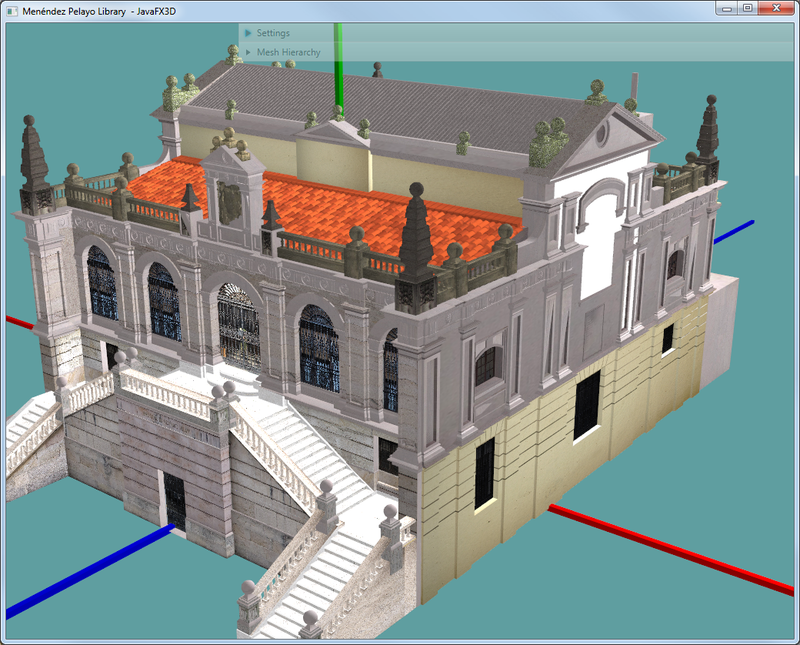 3DViewer is a full project you can download from the openjfx repository: http://hg.openjdk.java.net/openjfx/8u-dev/rt/archive/9e11fc21339e.zip/apps/samples/3DViewer/. Just unzip it, and click Open Project on NetBeans, select it, and click build and you should be able to run it clicking Run Project. Otherwise, go to the Jfx3dViewerApp class and select Run file. Hi Jose, thank you for sharing. This application is great! I was wondering if it was possible to update the colors of each piece, for example, taking a corner piece and updating the colors on each of its 3 sides based on user inputs. if so, how would one do that? thank you again. Blessings! Hi, you can indeed change the material of the meshes at any time. If you want to replace all the faces of the "cubie", you'll need to find out which other faces belong to that cubie. Excellent work on JavaFX, appreciate it highly. Are you also working on Open-dolphin with database based projects ? Could you please write an article if so ?